Elton John has heaped praise on Lady Gaga for taking her role as a good godmother so seriously. The Rocket Man star and his husband, David Furnish, asked the 29-year-old to serve as godmother to their first son, Zachary, following his birth via surrogate in December, 2010. She also took on the role for their second child, three-year-old Elijah, and Elton reveals he has been blown away by Gaga's hands-on approach to the job, in spite of the Oscar nominee's hectic work schedule. 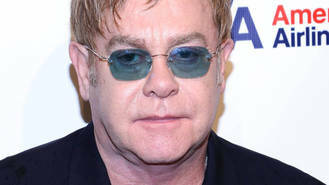 "She buys them presents on their birthdays and at Christmas, but more than anything, she's a good godmother," Elton gushed on U.S. daytime show The Talk. "She comes and she bathes them, and she sings to them, and she tells them stories, which is the best thing of all; it's the personal thing... It's easy to buy a present and send it round; she doesn't just do that, she comes round and spends time with the children and that's what I love about her." Gaga's dedication to the kids has also helped Elton and David keep their boys grounded as they strive to teach them the value of money and the importance of taking responsibility. Dizzee Rascal has joined the line-up for London's SW4 festival. Fifth Harmony were forced to change the name of their single when Rihanna released her track Work. Mariah Carey is dreaming of an all-star duet with Beyonce. Little Mix star Perrie Edwards is nursing a painful injury after accidentally setting her arm ablaze. The 27-year-old Ignorance singer and the guitarist, 34, were married at the Franklin Theater. Corey Taylor "might step away from Slipknot". Tame Impala joked Rihanna was "rude" for not speaking to them at the BRIT Awards on Wednesday night (24.02.16). Another day, another lengthy Twitter rant from Kanye West.